Big cities and metropolitan areas, due to their large populations, geographic expanse and complex social and political contexts, have in place extensive organizational and regulatory systems intended to bring order to living, working and development arrangements. Unintended consequences often make community building difficult if not impossible to navigate, especially for entrepreneurs and “outside” populations trying to gain access. Small towns often present fewer of these bureaucratic impediments. Combined with the pioneering, DIY spirit that has long predominated, they are fertile ground for Lean Urbanism and due for much-needed regeneration after years of neglect due to sprawl investment. Smaller self-governance dominates in the American landscape and small towns present numerous advantages for Lean Urbanism that far outweigh the disadvantages. According to the U.S. 2013 Census of Governments the number of governing structures continues to increase and now tops 90,000 state and local governments, including counties, cities, townships, special districts and school districts. What they lack in resources and “top down control” small towns gain in natural advantages for Lean Urbanism. Interdependence often develops naturally within small populations, making legislation unnecessary. Governance is simple and straightforward. Because small governments can’t provide the cultural and social services of larger jurisdictions their costs are comparably less. A quick look at small town ordinances on Municode’s website suggests they adopt few regulations and most address quality of life issues like “nuisances” rather than land use, building or business regulation. This may be because new business, “development” and new building are less common in small towns and therefore celebrated, much as they were many years ago. For those who wish to practice Lean Urbanism, small towns translate into more self-reliance — doing with less up front, taking more risk and more ownership over one’s personal and professional life, being personally accountable for outcomes and enjoying more direct benefits of one’s labor. 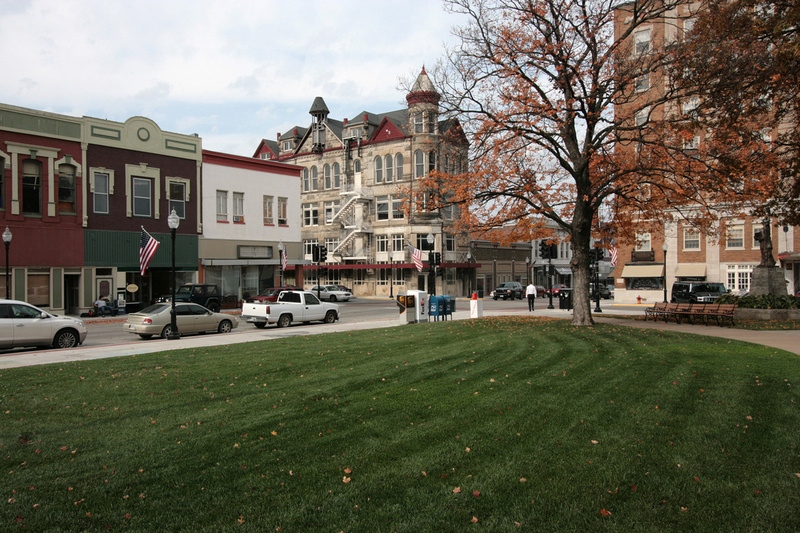 Small towns are typically networked in urban clusters, at approachable distances of between 2.5 to 3 miles apart along state or county highways, and surrounded by arable land. If adjacent to metro areas they are often within reasonable distance of larger economic, cultural and recreational resources. Some have small upper-level educational institutions such as trade schools, community colleges, or private colleges historically for women and the military that today can be resources for collaboration, support and networking. The walkable form of small towns makes them ideal for inexpensive, green living. They feature compact streets grids with lot platting that supports small, incremental building and vacant lots ready for infill. Many are located at intersections of historic transport routes and still retain access to underused but viable rivers and/or rail, where remnants of old infrastructure remain for potential reuse. Town centers with courthouses or central lawns and bank buildings at important intersections are typical, and churches (some of the most over-looked, unique and beautiful architecture in America) are almost always within one or two blocks. Town centers, Main Streets and edges boast a clear hierarchy of infrastructure and classical-to-vernacular architecture. Numerous traditional building types in various states of repair, disrepair and negligence offer the full gamut of opportunity for Lean preservation, reclamation and reuse. Building types are available that fit any working and living arrangement, including artisan and retail. Small towns offer a unique opportunity to build on good existing character and craft personal space tailored to one’s preferences and needs. Startups can be housed in the Leanest, “greenest” buildings — the ones that are already built. The classic Main Street mercantile buildings common in small and medium-sized cities represent the second largest quantity of commercial building stock in the U.S. These mixed-use buildings feature ground floor retail with one or two stories of office or residential above, party-wall construction and are primarily pre-1940s era vintage — buildings built to last. Renovating and repurposing historic buildings may largely mean inexpensive cosmetic, interior and nonstructural upgrades — updated electrical wiring and HVAC chief among them. Their good scale, proportions, open floor plans and operable windows make them highly flexible. Historic buildings in most states are also exempt from the full extent of ominous International Building Code and fire regulations, and even ADA requirements are lessened. For instance, in 2013 Maryland adopted a “Building Rehabilitation Code” that adapts the IBC to historic properties. The result is beautiful buildings with authentic materials, excellent, handcrafted elements and real estate that far exceed the value of new construction. Houses and cottages on piers, protecting them from ground water, are immediately adjacent to town centers. They can be financed through local banks and often can be bought without contributions to realtors. Most are in tact and free of modern “improvements,” offering the artisan or self-build entrepreneur the opportunity to own high-value housing with minimal work. The cost of living and doing business in small town America is usually much less expensive than in cities, including the price of real estate, transportation, insurance, childcare, general services and business needs. Main Street buildings still in service are home to government offices, libraries and locally owned business such as insurance agencies, hair salons, attorneys’ offices and specialty stores. The most common and oldest business in many small towns is the family-owned pharmacy (whose prices, studies show, rival the chain pharmacies), followed by hardware stores. Corporate franchises are more often on the town edge or in highway gas stations. Building community in a small town tends to be a “shared project,” as change affects everyone and residents take change personally. The processes and impacts are much more visible and construction projects tend to be higher profile. Builders who recognize and are sensitive to a community’s needs and desires are apt to be celebrated. Small towns embrace new businesses. Government employees and elected officials often promote their openness towards new investments and engage them on a personal level. Many small towns waive permit and other fees, which are in most cases already lower than in big cities. Building inspections are often seen as “professional guidance” programs since most renovation and new building is accomplished by locals who do the work themselves or with local small builders, craftsmen and handymen. Small towns usually have unmet needs and are well-suited for many of the industries predicted to grow in the coming years, many of which have low barriers to entry. These include internet-based consulting that emphasizes marketing or advertising, web design and program development, or local services such as child-care, eldercare and home health. 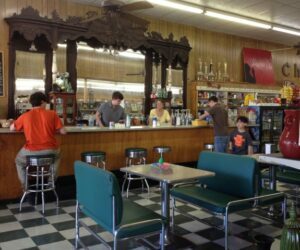 Cafés and the traditional “general store” that customizes itself to local needs are proving successful. Current residents — many aging-inplace boomers who are owners of third generation Main Street businesses – welcome new, revived storefronts. A number of national trends make small towns ideal places for community regeneration through Lean Urbanism. These trends include aging populations not ready to retire but wanting to downsize, educated Millennials unable to find employment, young families needing a social network, a preference for authenticity and “the local” and technology that allows a virtual or home-based workforce. In small towns retirees can find low crime rates and peaceful environments in which to start second careers. Millennials can find low-cost work space to start businesses. Parents can raise children in quaint, affordable, walkable neighborhoods adjacent to urban Main Streets and park-like squares. Immigrants can find relaxed environments in which to replicate cultural practices that might be shunned or illegal in more urban areas, and find unmet needs providing jobs or to start businesses. Smaller jurisdictions typically lack large budgets and resources, significant cultural attractions and top-notch educational resources. Most are stressed from losing jobs to the cities, disinvestment and rural highway sprawl, and feature mature, underused infrastructure. They tend to have small, closed societies with minimal social and political development and parallel slow change. Most have older and poorer populations and are politically conservative. Their tight social networks, in which there is common knowledge about everyone and every thing affects an individual’s opportunities and can make small towns stifling. If Lean Urbanism equates to low costs, low barriers to entry, low regulations and shared economies, small towns are ideal locations for individuals to become involved in DIY (Do It Yourself) projects and slow, frugal growth that has tangible impact. Because community building in small towns is so evident it is therefore measurable. Towns should embrace the opportunity to reclaim these small places as labs to experiment in and measure results of Lean practices in building, social entrepreneurship, business, financial management and governance restructuring. Results would be self-affirming and replicable in other small towns as well as at the neighborhood level in larger cities. The most important community goal is the same everywhere — to repair and restore underused buildings, to infill vacant lots and grow neighborhoods with locally relevant small business, services and more diverse housing. America has enough infrastructure and building vacancies in small towns to do this many times over, providing a variety of personal and professional opportunities. Places ready for new building will need new development codes to protect local character and these should be Lean, one-page codes with sensible guidelines. Investment in more sustainable, Lean infrastructure such as shared water collection, more efficient energy sources and wireless technology are needed at the building and block levels in small towns to support retrofitted mixed-use buildings and to accomplish positive environmental, social and economic impacts. Small towns could benefit from a Lean Toolkit, and lessons shared with adjacent jurisdictions could have regional impact. They already utilize networks like The National Trust for Historic Preservation’s Main Street Program, which employs a new urban-friendly four-point approach to help towns capture assets: Organization (collaboration and networking), Design (building preservation and urban design), Marketing (branding) and Economic Restructuring (management of shared resources). Small façade loan grants and microloans with low interest rates and short-term payback periods offered by local banks help owners improve building façades to kick-start physical improvements. Small town America is on the verge of a Renaissance lead by new types of entrepreneurial pioneers wanting to make a real place for their lives and livelihoods. Lean Urbanism can play a leading role in this revitalization. The small town regenerated is the future of Lean America, and returning to our traditional urban past offers a lot to relearn. Ann B. Daigle is an urban planner and designer specializing in humane approaches to community building. Her passion is the regeneration of historic neighborhoods into vibrant, beautiful and walkable places. She happily lives and works in the great City of New Orleans, Louisiana, where she is a community activist and serves as advisor to Smart Growth Bywater. 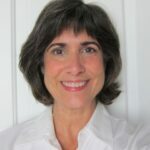 Ann’s past posts include Manager of the New Orleans “Culture of Building” and Crafts Apprenticeship Programs for the Prince’s Foundation for Community Building, Urban Development Manager for the City of Ventura, CA, and Special Advisor to the Mississippi Development Authority for the post-Katrina Gulf Coast. She is also a partner in The Company Farm Pecan Grove & Market, a family-owned farm in North Louisiana. Her educational background is in Architecture, Communications and Social Psychology.